Today class, we are going to discuss how a plug swims and how to tune it to swim exactly the way we want. Most wooden lures come out of the package and swim just fine. However there are the days where there is some wind or chop on the water and the fish want the lure diving deeper, just barely subsurface or they only want it waking on the surface. The ability to finely tune your swimmer to fish the conditions perfectly will definitely help you catch a few more fish. We are going to use the 3" pike as the example in today's lesson, so let's begin. There are two main ways that a lure will swim. Dave Anderson wrote a really detailed article in Surfcaster's Journal about how a plug swims, and I encourage you all to check it out. But I am going to go over the two basic functions of a wooden lure, roll and wag. 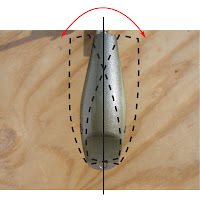 Roll: This is how the rotates around the length of the lure, or the Y axis. The metal lip is going to catch water as the lure is retrieved. The water will come over the lip and onto the shaped head of the pike. As the water exits the top of the head, it will cause the lure to roll to one side, catch its balance and then roll to the other side. Wag: Wag is a bit easier concept. It's how the rear of the lure is rotating and pivoting from the front of the lure. Like a dog wagging its tail. The lip and head of the pike are moving a lot of water out of the way, the water then slides along the side of the lure, but it is not as strong and back eddies to a certain degree, causing the rear of the lure to wag from side to side. The 3" pike will swim head down, and the tail on the surface wagging. There is certainly a lot of personal preference for how you like a lure to swim. Some people prefer the tight roll of a lure, with little wag. Others like little roll and lots of wag. I like a nice mix of the two, with a little bit more emphasis on the wag. Fishing is 95% confidence in what you are casting and how it fishes. If you can tune a lure to really match your confidence and the conditions, well, that's what you should be doing. So in order to make a lure really swim the way you like, we make a few minor modifications to tune it. 1. Line tie: When I am referring to the line tie, I am talking about the loop at the front of the lure where you tie your line to, whether it be direct via a loop knot, snap or a clip like the Breakaways, etc. I am not fond of a clinch knot when tying to a lure. I think it steals some of the life from the lure. There are two things we can do when modifying the line tie. We can bend it up towards the top of the lure, or bend it down towards the bottom. Here's what happens. Bending it down: The lure will fish closer to the surface, but with more roll. Bending it up: The lure will fish deeper in the water, but with more wag. There are some precautions to be mindful of. While bending the line tie down, you might get the lure on the surface like you want, but it might require a slower retrieve so the lure doesn't roll over. You don't need to be very aggressive bending the line tie. As the saying goes, "a little pinch will do". 2. 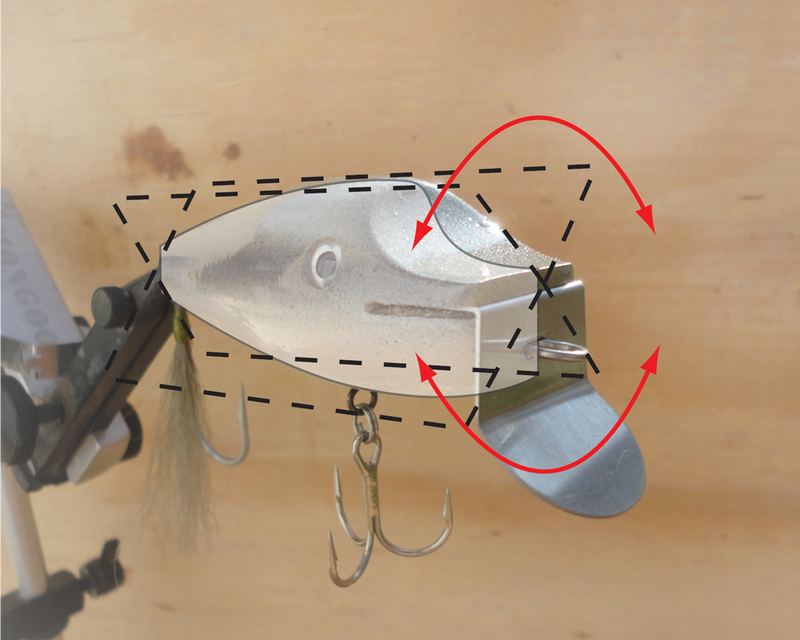 Hooks: Changing the hooks can also change how a lure swims. Changing to a heavier hook can add a little more weight to the lure and changing its balance, typically giving the 3" pike a bit less wag and more roll. Changing to a lighter hook will do the opposite, more roll and less wag. 3. Lip angle: It is typically not advised to change the angle if the lip, but sometimes you have to do what you have to do. I usually look at this as more of a last resort and I always adjust the line tie before the lip. Bending it down: The lip will push more water, forcing it to stay closer to the surface. Bending it up: The lip will force more water of the top of the lure making it fish deeper. This is just the basics for tuning the 3" pike. A bit of experimenting will go a long way to getting the lure to fish just perfectly. A lot of these modifications will also work on danny's, Hahn's, R.M. Smith's and other metal lipped swimmers as well. Fish you lures in a variety of conditions. Don't just pull them out when your go-to patterns are not working. Develop confidence in them by making these minor tweaks to really make them shine. Eventually they will become a regular part of your arsenal in the right conditions. Be sure to leave a comment with any questions or comments. Now go fishing!